As Part Of Lorell'S Modern Chair Series, This Guest Chair Features A One-Piece Molded Seat And Back With Bonded Leather Cushions. Chromed Metal Arms Are Covered With Leather Pads For A Professional Look. Cantilever Base Is Made Of Polished Aluminum. 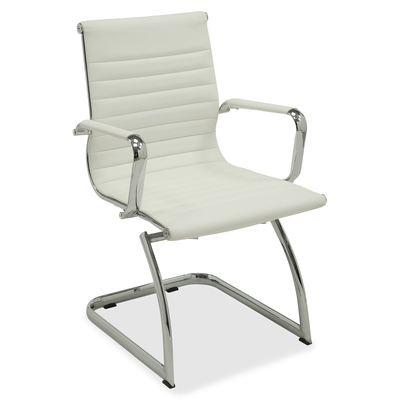 Weight Capacity Is 275 Lb..
As Part Of Lorell'S Modern Chair Series, This Guest Chair Features A One-Piece Molded Seat And Back With Bonded Leather Cushions. Chromed Metal Arms Are Covered With Leather Pads For A Professional Look. Cantilever Base Is Made Of Polished Aluminum. Weight Capacity Is 275 Lb.